Infuze coffee is the first of its kind. 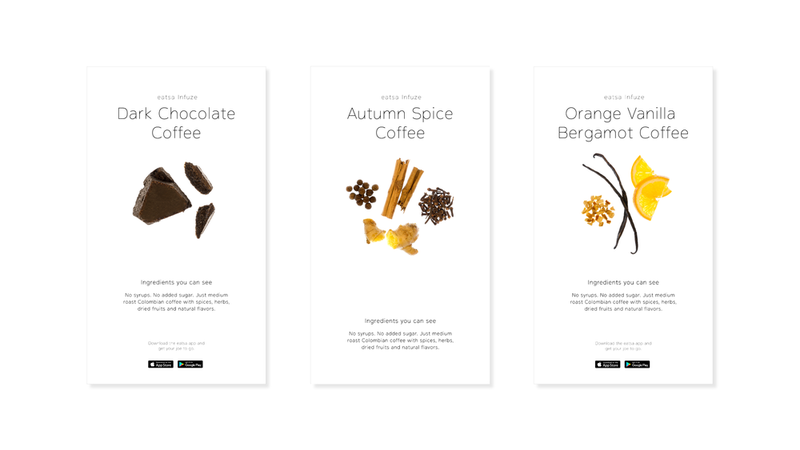 The eatsa food science and industrial design team came up with a way to use natural, whole ingredients in an infuser stick to give the coffee natural, distinct flavors–from dark chocolate to orange vanilla bergamot. This presented an interesting challenge of needing to communicate both the value and quality of the ingredients, as well as reminding customers how to use the infuser stick itself. I directed the photo shoots and worked closely with our food science and product teams to ensure a consistent customer experience from the first email they received until they picked up their coffee in store.